We're up to the letter F in the latest Sunday Stamps journey through the alphabet. Father Flanagan (1886-1948) stamp issued in 1986. The link takes you to his wikipedia page. Feathers and flowers on the Eastern Bluebird issued in 1991. 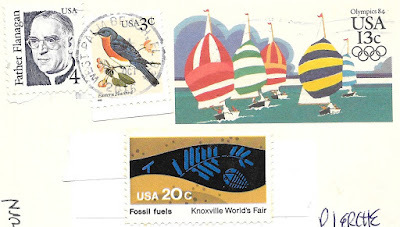 Fossil Fuels on the 1982 stamp issued to celebrate the Knoxville World's Fair, and designed by one of my favorite artists, Charley Harper. I'm not sure about finding F things on the preprinted postcard stamp issued in 1984 for the Los Angeles Olympic Games. Can it be termed a Fleet of yachts? Can the Foam on the wakes count? Let me know if you have other ideas on this or any other stamps. For more links, head over to Sunday Stamps. But for sure that is a lot of F's on a single card! I didn't realize there were so many Fs on this postcard until I started looking for today. Maybe F for Foresail on the boats? I knew t here'd be a sailing term I would miss. And I see Florida in the postmark! ...and the five sailboats are floating! I don't think the yachts are in the Fastnet Race - that's not an Olympic event.